I know that I sound like a broken record when I say this, but here goes: in this very important election year, the selection of a new Wright County Sheriff is perhaps the most important decision that residents of Wright County will make in terms of the direct impact it will have upon our everyday lives. I think it’s safe to say that voters have been provided every opportunity to hear where the candidates stand, both pre and post primary. All candidates should be commended for their active communication on social media, their attendance at community events and their willingness to talk with voters about where they stand on the various issues. 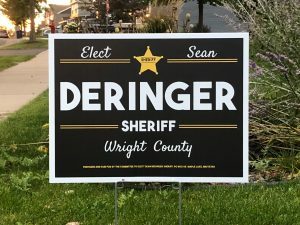 I have read and listened to just about every piece of information I could regarding the final two candidates, and based upon that information, I am proud to support Sean Deringer in his campaign to become the next Wright County Sheriff. I have said for a number of years now that Wright County is changing. I believe that, with a large swath of the County becoming, for better or for worse, Twin Cities suburbs, the next Sheriff needs to be able to lead the WCSO into a new era with a new perspective as to handling the law enforcement needs of Wright County. When this campaign began earlier this year, I was supporting a friend who had run previously. Shortly after my friend announced, Sean Deringer threw his hat in the ring for the job, and shortly after that on March 27, both candidates joined Bob Sansevere and his guests (myself included) on Bob’s BS Show podcast. During the show I posed to the candidates a question as to how, if elected, they would handle a situation which my wife and I had involving multiple negative interactions with a particular deputy. A day or so after the show, my phone rang. It was Sean Deringer. Did I mention that Captain Deringer made that call knowing full well that I was supporting his only opponent at the time? By the time our call wrapped up, I learned that the deputy with whom we had an issue was no longer with the WCSO. Sean provided me with all of the information that he had available on the incidents we had involving this deputy. It was such a relief to have someone from the WCSO be proactive and forthcoming and Sean’s actions that day gave our family a measure of closure. Since then, I have called on Sean a number of times for a variety of issues – some personal, and some professional. He has always responded promptly and taken my issues seriously. In my previous endorsement of my friend for the primary, I stated that if I could have voted for two candidates to move on to the general election, Sean Deringer would have had my vote in the primary as well. So, on primary night, when Sean moved on and the candidate I had been supporting did not, my choice for the general election was a no-brainer. If you would have told me at the beginning of the year that I, with my prior complaints about some aspects of the Sheriff’s Office, would be supporting a member of the current Command Staff to take over the top job, I would never have believed it, but that’s how impressed I have been with Sean Deringer and his plans to improve the WCSO. 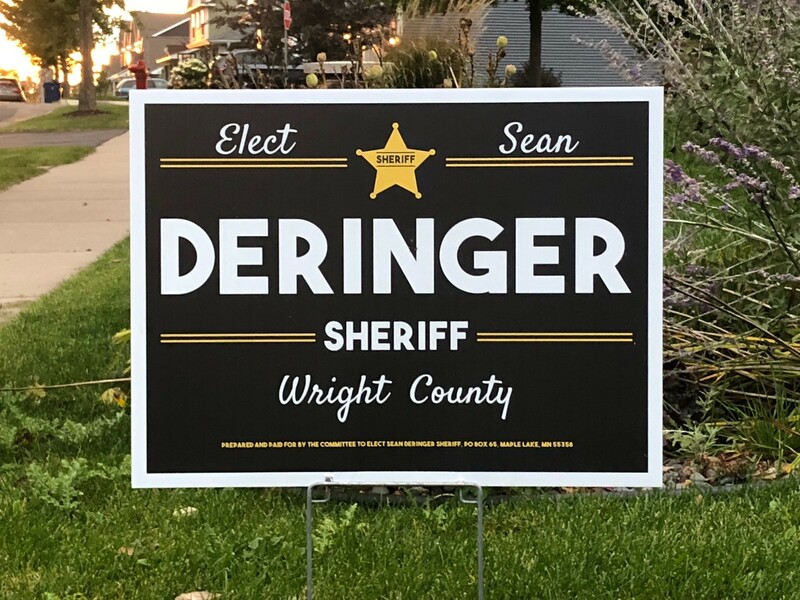 I truly believe that Sean Deringer is the best candidate to be the Wright County Sheriff, and I truly believe that the Wright County Sheriff’s Office will be a top notch law enforcement agency under Sean’s command. Bottom line, Sean gets what’s happening in the County. He gets that the cities east of Highway 25 are now essentially suburbs, and that he gets that there are major challenges ahead for this Sheriff’s Office that must be addressed. Regarding the other candidate for Sheriff, Mike Kaczmarek, I have had the pleasure of meeting him and hearing about his agenda if elected. While I have no reason to believe that Mike is anything other than an honorable and decent guy, I simply do not believe that he has the experience or the vision needed to move the WCSO forward in the manner needed to be effective law enforcement agency for an ever changing Wright County. I have heard Sean talk about his experience, why he decided to make a career in law enforcement, and what he wants to do to improve communication, transparency and accountability if elected. I have talked to him about what his training course at the FBI National Academy in Quantico, Virginia entailed, and I believe that experiences like that just make Sean an even more attractive candidate for Sheriff. Like me, Sean Deringer is not a native of Wright County; he chose to live here. Like me, Sean decided long ago what path he wanted his career to take and he has taken the steps necessary to get to this point. That’s why I know that when Sean says he’s going to do something, I know he will see it through until he accomplishes his objective. That attitude is what makes a great leader, and I will be proud living in Wright County with Sheriff Sean Deringer in charge.